When you visit the Grand Canyon, there are two choices: the South Rim or the North Rim. 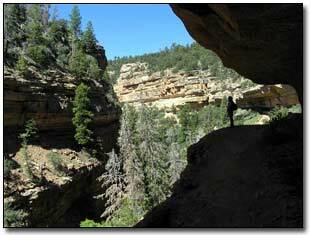 Here are a few hikes for the North Rim. The North Rim is much less crowded than the South Rim and offers a lot of remoteness and unspoiled experiences. The North Rim lies at the end of a dead-end road and has about 1/10 of the visitors that the South Rim has. There are more overlooks from the South Rim roads than the North Rim and many of the North Rim trails are plateau-type trails. The North Rim only has one maintained trail that descends into the canyon... the North Kabob Trail. The trail goes down to the Colorado River and crosses over to the South side and back up again. This is not an easy hike and the longest distance you should attempt to hike in one day is about 2 miles down because the hike returning on the same 2 mile trail is extremely tough. The North Rim has many 1-2 hour hikes that are very rewarding with beautiful views. If you want a lot of easier hikes and at the same time see a lot, here are a few of them. From the North Rim Entrance Station, at approximately 9½ miles, turn left on to the Cape Royal/Point Imperial Road. The road is approximately 20 miles long and the travel time is extremely slow as the road is very winding and narrow. The Ken Patrick Trail from Point Imperial has beautiful panoramic vistas. Just park in the parking lot and walk down the trail. You only have to hike about 1 mile down the trail for the viewpoints. As soon as the viewpoints end, turn around and return to the beginning. I happened to see my first porcupine as well as some deer driving down the road on the way to the Ken Patrick Trail. I did not enjoy the Cape Final Trail as the boring trail is on a 2 mile dirt road in a ponderosa pine forest. I would not recommend this trail as there are many other trails that have better views, are a lot more interesting and shorter. The Cliff Springs Trail is a great trail. It is about 1 miles in and you can go even farther. The first mile is maintained and the last mile or more isn't. You actually hike underneath the Grand Canyon rim.... a great experience (top photograph). Be sure to bring hiking poles, some food and some water as it gets hot and somewhat tricky hiking. Be sure to stay away from all the cactus as it will do serious damage on your legs... big long stinging cuts! The Roosevelt trail is also easy and extremely beautiful with great vistas. The trail is not maintained and you will have to walk through and over high grass, fallen trees and other forms of vegetation. Make sure you complete all the various trails that circle around the area. You will be rewarded by standing over sheer cliffs. 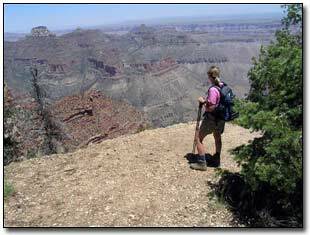 The Cape Royal Trail is short and very easy walk to one of the best vista views on the North Rim. The trail is paved and is approximately .4 mile. Park your car in the parking lot and walk down the path. Just carry your camera as that is all you will need. Hope you have a great time hiking Grand Canyon National Park on the north rim side.